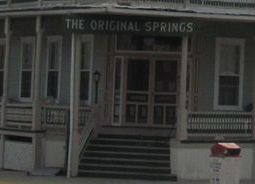 It has become somewhat of a tradition for CAPS and my family to visit the Original Springs hotel during Spring break. Last year Trish and Dave were precluded due to bad weather. Although that was a very relaxing weekend, we ended up rushing home a bit earlier to beat one of the season’s biggest snowfall. During that visit I did have one strange experience. After swimming in the pool with my husband and children, I decided to get out earlier and went back to our room that was situated next to the pool area. As I was getting changed in the bathroom, I heard someone walking through the room. When I opened the bathroom door, to my great surprise, I was alone. We decided to start our investigation on the bottom floor where we had some very strange high readings on our K2 and EMF meters. Although this may have been caused by something electrical related; Trish did hear a whisper in her ear in that section. Once we ventured up to the second floor, the detectors settled into a normal range. At one point, while our meters were placed on a cot, it spiked a couple of times. Dave was also experiencing some camera problems during this period. For some odd reason every time he tried to take a photo of Trish and I, it just didn’t want to work. However when he pointed down another hallway, it work perfectly fine! Strangely he heard a whisper next to him at the same time he was having these technical difficulties. We then decided to try with my camera and sure enough it malfunctioned as well until I pointed it towards the direction of the other hallway. After some time passed, we went to the third floor room while my hubby and kids were swimming. While there we heard several loud noises, and this time I was the one that heard a whisper in my ear. During the late night hours Trish, Dave and I decided to sit near the pool area to scrutinize the surroundings. Occasionally we would hear a loud noise that seemed to be near us, but other than that it seemed very peaceful. There were a few times that Trish and I felt some static electricity and goose bumps, as if someone or something was walking between us. Trish also was seeing some movement going on next to the restaurant’s indoor entrance. Interestingly enough as Trish and I were passing that area later to return to our rooms, we heard a really loud noise emanating from the unoccupied kitchen. After having a good night’s, or rather morning sleep, it was time for us to vacate the premises. Whether you should decide to pay the hotel a visit for ghost hunting reasons or just to relax with friends or family, Original Springs is always a delightful place to stay. This is a female voice captured in the Bath house. Sounds like they are saying "Alison". This was also in the Bath house. Trish is talking about the strange windows, and as I was agreeing with her, another voice seems to echo my opinion with "they are" around 5 seconds. This was captured in the hallway near the pool area. I think the voice is saying "Fourth and haunt". This was taken in the Bath house lower level while our detectors were spiking. Sounds like a child saying " hey buddy". We caught this one as Trish and I passed the kitchen area and heard a loud noise. Around 4 seconds there is a whispering voice.